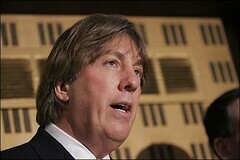 Detroit lawyer Geoffrey Fieger was indicted on Friday, in large part for allegedly conspiring to make illegal campaign contributions to John Edwards. Geoffrey Fieger, the Southfield lawyer known for winning multimillion-dollar civil judgments and antagonizing judges, has been indicted by a federal grand jury on criminal charges of conspiracy, obstruction of justice, making illegal campaign contributions and causing false statements. The indictment charges Fieger and a law partner, Vernon (Ven) Johnson, of conspiring to make about $127,000 in illegal contributions to Democratic presidential candidate John Edwards' 2004 campaign.